In July of 2002, the International Spy Museum opened in Washington, D.C. as the only public museum in the nation dedicated solely to espionage. Today, the museum remains the only institution in the world to offer a global perspective on a profession that remains almost invisible. Visitors are able to glimpse a view into an occupation that has shaped the history of the world and continues to have a substantial effect on events around the world. The Museum offers the largest collection of artifacts related to international espionage ever offered for public display. Many of the artifacts on display in the museum are now available for public viewing for the first time. These objects illustrate the work of world-famous spies and momentous espionage actions while also bringing the techniques and strategies of the people behind secretive spy missions to life. Your experience at the International Spy Museum will begin with an orientation to the tools, techniques, and tradecraft related to espionage. 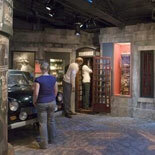 Visitors will view a Briefing Film as well as tour of the “School for Spies”; home to some 200 artifacts. The School also features interactive exhibits that involve threat analysis, audio surveillance, and how to maintain one’s cover. Visitors will also be able to utilize their newfound knowledge throughout the remainder of the Museum as they continue to explore two entire floors of galleries that outline the craft of espionage from ancient times to the present day. The Museum’s exhibits highlight stories of real life spies—the details behind their missions, their ultimate fates, and how their spy work affected some of the most crucial times in the history of the world. Your Museum experience will conclude with a film that details the importance of intelligence work in today’s modern world.